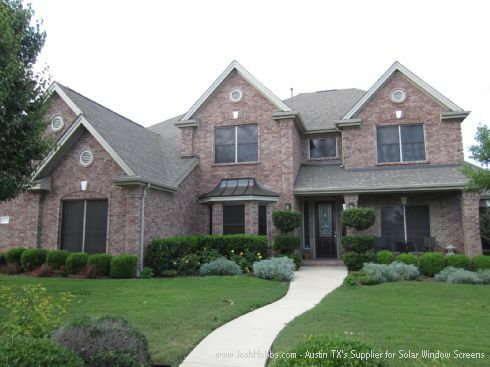 Looking for really good installed Solar Window Screen Austin TX pricing for your Home? And, you don't want to make any kind of sacrifices or compromises to get this great installed Austin Solar Screen pricing. 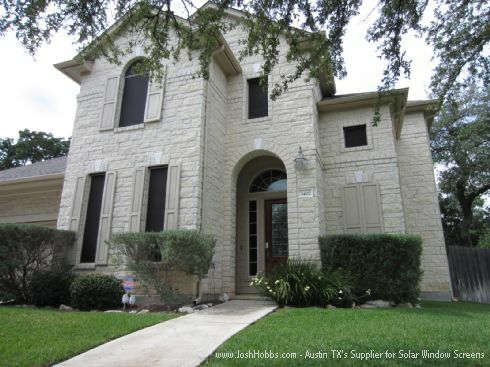 By sacrifices I mean you want the best possible Austin solar window screens you can buy and to not make any compromises I mean that you want the best possible solar window screens you can have custom made for your home's windows installed by a meticulous to-the-craft-veteran of the industry. 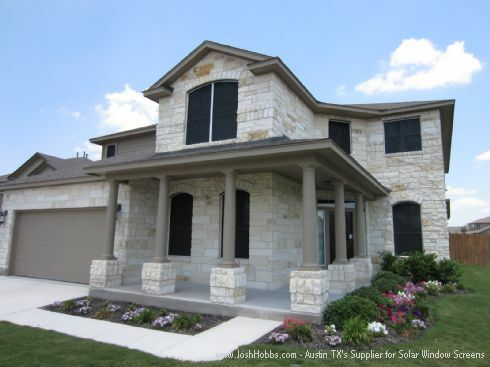 There is NO reason to compromise, and with JoshHobbs.com as your Solar Screens Austin Texas supplier there will be absolutely NO compromising. Don't consider making the solar screens yourself, and by no means don't get them from anyone that isn't a true industry professional with many positive references. 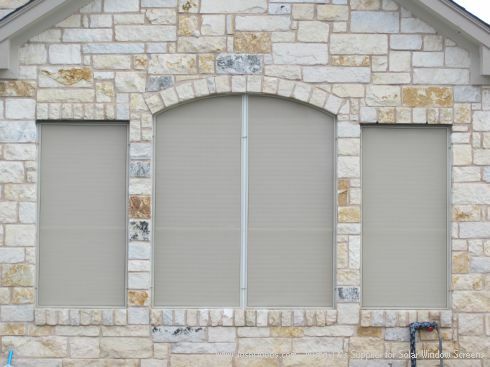 Our installed Austin Solar Window Screens are not something that's factory stamped out with set manufacturing specifications and installation methods. Every window takes it's own custom made solar screen made uniquely and specifically for that window. And each window will require it's own unique way of installation for that solar screen to mount to it. Like most everything else, learning the proper ways to build solar screens and the correct methods to install the custom made solar screens comes from years of experience and attentiveness to the details of what you are doing. 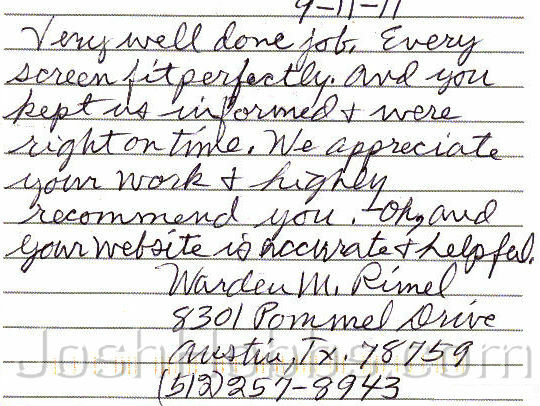 Please read on our website where we have posted 300+ of our Solar Screen Austin TX Customer Reviews just like what we have posted below showing where people are complimenting and praising the work we have done for them. The best way to see how good someone is at their craft is through the words of others that have used them. Let others tell you their story to share their positive experiences they have had with us to help you see why we are so highly rated in our industry. Interview from one of our Austin Texas Customers. 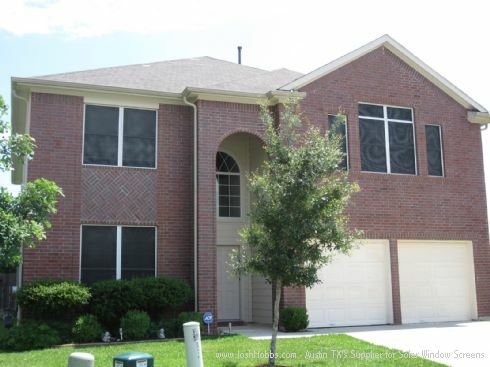 I service all of Austin Texas whereby I get to see all over town solar screen installations that I did not get to do, and for too many of them I am astounded at how bad they look. Some that I see are minor detractions, things that are done wrong, while others are blatantly obvious. I know the installers out there that good work, and sometime if for some reason I have to make a recommendation for a job I can not do, it's those folks that will be the beneficiary. Most companies have careless employed installers that do the work for them, and it's mostly those installs I see that I am least impressed with. But for even those guys that do the work themselves, for themselves for the own solar screen business, there are many that I am far from being impressed with. For me, either you do a job right, or you don't do it at all. I do everything myself, with my own two sets of hands. I 100% make sure that every job I complete is done 100% to my satisfaction, that the solar screens fit perfectly on to the window and that there is no waving of fabric and all mounting hardware is uniformly installed and that everything else just plain and simply looks good. No exceptions. When you have been doing this as long as I have you get to see everything. 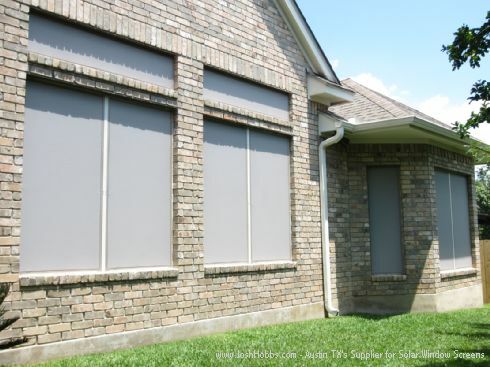 I see all over town where other installers have tried to get away with things like installing solar window screens that are too short because they error when they made them or for whatever reason. I've seen wavy solar screens here in Austin Texas that have huge gaps, screens that are crooked, screens that are bent, screens that have been velcro'd and taped on as a way of installing, installers that have used cheap mounting hardware, the wrong kind of screws, the wrong size and kind of mounting hardware, inferior fabrics, wrong sizes of framing. You name it and I have seen it, all of it. No way will I ever leave a job if it is not perfect. There will be no compromising with Josh Hobbs! On our website we have many pages that include 200+ Hi-Res Solar Screen Pictures of installations that we have done around the Austin Texas area. Josh was prompt and courteous. The solar screens look great. 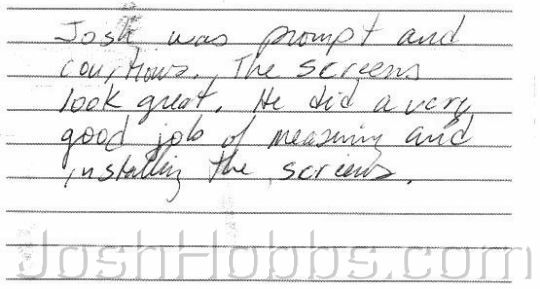 He did a very good job of measuring and installing the screens. Your purchase and installation process is great. No mess in the yard or flower beds. To see what your Installed Austin Solar Screen Pricing is please follow this link to visit my website where my pricing is openly published. 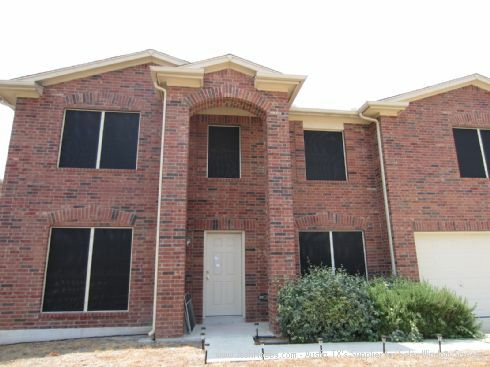 This was a great Austin solar window screen investment! We moved here from California. Could not believe how hot it got this summer in Austin Texas. 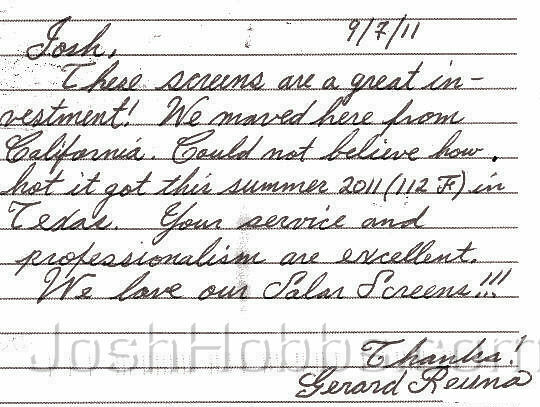 Your service and professionalism are excellent. We love our solar screens!!! Thanks! 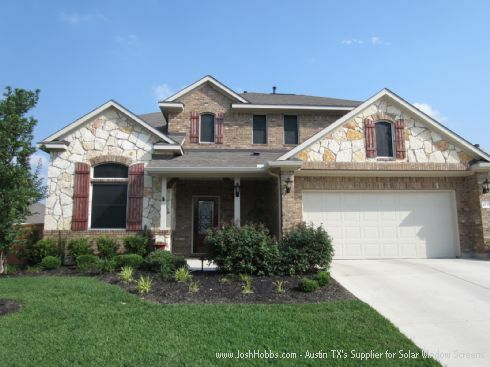 If you have never had solar screens and are wanting to learn more about them, please visit my website JoshHobbs.com where you can learn about our Solar Screens and you will be able to learn about us an industry leading Solar Screens Austin Texas supplier. 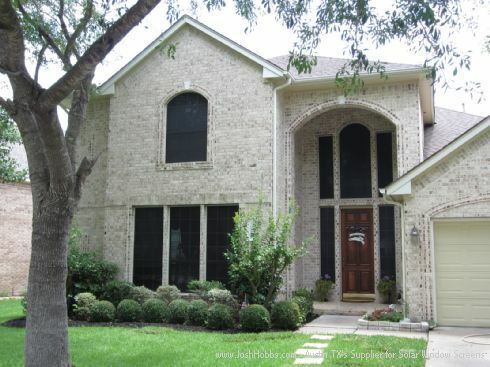 From my website you'll find a thorough Questions and Answers page that will answer all your solar window screen questions and there are hundreds of hi-resolution pictures of our installations and pages of written reviews from our Solar Screens Austin TX customers where you can learn a lot about us and our product from. Josh and Paula, you did a great job. My wife was out of town when the solar screens were installed and when she got home and went into the back rooms she said, “Geez, its not blazing in here anymore”. They look great and do a nice job of keeping the west facing rooms much cooler. Price was great, installed the day they said they would be. We are really pleased with our solar screens! 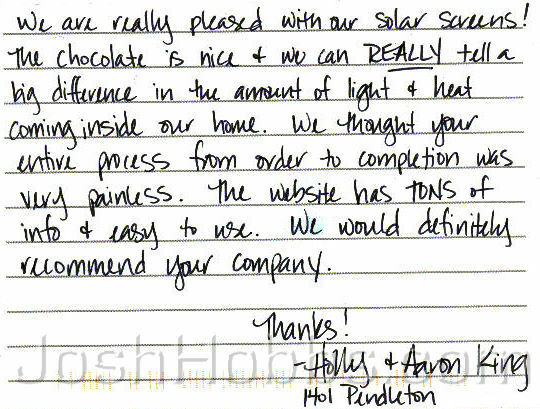 The chocolate is nice and we can REALLY tell a big difference in the amount of light and heat coming inside our home. We thought your entire process from order to completion was very painless. The website has TONS of info and is easy to use. 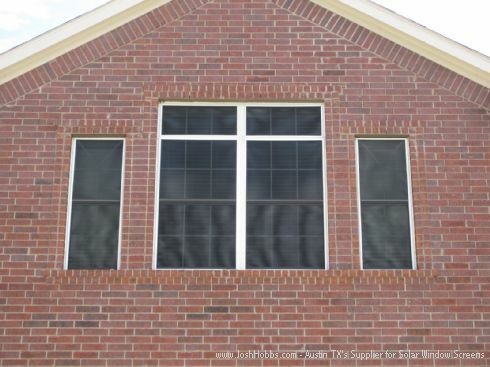 To learn about how I install my solar screens to your home's windows, on my website I have made a thorough and detailed page of videos explaining and illustrating the many different installation methods I use for the different kinds of windows out there. Austin Solar Screens FOR Less Video made showcasing this webpage. JoshHobbs.com couldn't be easier or more AFFORDABLE. 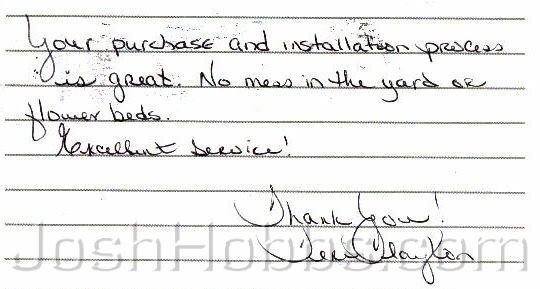 Read our Austin TX Solar Window Screen Yelp Reviews here.